"Walk with me," muttered the man under his breath  and then, for the next hour, while we wandered through the streets of the Libyan capital and talked softly in the corner of a café, he described the chilling aftermath of the rebels' defeat in Zawiyah. That city lies just 30 miles (48 km) west of Tripoli, and according to the man, it saw a mass roundup of suspected rebel sympathizers and fighters by Muammar Gaddafi's forces, as well as the takeover of Zawiyah's hospital by government loyalists, with at least one wounded teenager smuggled out of the medical facility for fear that he would be arrested in his bed. "It is worse than you can imagine, far worse," said the man, a longtime resident of the oil-refinery town. Encircled by military and police checkpoints, Zawiyah  a city of 200,000 people and home to Libya's second biggest refinery  has been almost entirely cut off from journalists for weeks, except for two brief, government-sanctioned press trips immediately after Gaddafi's victory there on March 10. Since late February the town has also had no telephone service, mobile or landline, because the government cut all connections when the military launched its counteroffensive against the rebels. For two weeks, the rebels fought a bitter war against Gaddafi's military virtually on the doorstep of the capital, in a crucial test of the regime's ability to survive the monthlong revolt. Until now, no details have emerged about what retribution was exacted against Zawiyah in the wake of the rebels' defeat  details that may offer a window into what could happen in the coming days or weeks in eastern Libya should the military close in on the rebel headquarters of Benghazi, as it seems poised to do any day now. Judging by Zawiyah, Libya's rebellion  if it is finally crushed  will exact a heavy price. Putting himself at huge risk from security forces, the man  let's call him Ahmed  arranged to meet me alone in Tripoli on March 17 in order to outline what has happened inside Zawiyah. Although his account cannot be independently verified, he describes a town living with deep fear and palpable grief, and where long-simmering dissatisfactions about Gaddafi and his regime have hardened into hatred. "Everyone hates Muammar Gaddafi now because we have had 42 years of suffering," says Ahmed, adding that he thought "thousands" had been rounded up by the military, which "has gone street to street looking for people." Ahmed says antigovernment activists whipped up a rebel force hurriedly, recruiting in the central square in February and gathering about 300 to 400 young men who had precious little military experience. "Their morale was very high at first," he says. With many residents already anti-Gaddafi, the fighters moved in on Zawiyah's military base shortly after the rebellion began and boosted their arsenal of hunting rifles with automatic weapons and rocket launchers. Ahmed says he witnessed the flight from the military base of a few hundred soldiers who appeared to be non-Libyan, "mercenaries from Africa," as he put it. Then came Gaddafi's military, which was stacked with soldiers from the Libyan leader's birthplace of Sert, about 300 miles (480 km) east of Tripoli, and from the Sahara Desert town of Sabha, where Gaddafi commands strong tribal support. 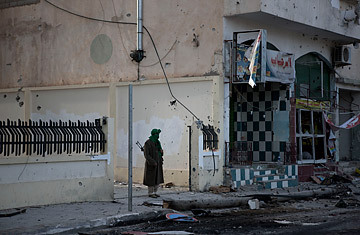 "They don't trust the soldiers around Tripoli or Zawiyah, because they don't like Gaddafi," Ahmed says. Despite the rebels' inexperience, they fought a well-disciplined battle, dividing themselves into brigades that fought in shifts, according to Ahmed. "They were incredibly brave, quite good," he says. The town's hospital's doctors, who included a close associate of Ahmed's, counted 175 people killed in battle; government officials have said few people on either side were killed in Zawiyah. Then, around March 10, the rebels finally ran out of ammunition  with no hope of fresh supplies. Facing imminent defeat, many of them melted underground within Zawiyah or fled the city along with thousands of terrified residents. By then, more than 20 fighters had been buried in Zawiyah's central square. That makeshift cemetery was bulldozed on March 10, an act that appalled local residents. Hours later, government officials escorted about 100 foreign journalists into the square for a small victory celebration, amid the shattered mosque, four-star hotel and bank and office buildings, which were ravaged by rocket and tank fire. The town appeared almost empty on March 10, but government officials denied that Zawiyah's residents had fled. Instead, several  including Deputy Foreign Minister Khaled Kaim  told journalists in Tripoli that the locals celebrated after being liberated from foreign al-Qaeda terrorists, who they say were behind the uprising. Ahmed insists the fighters were local residents and that since March 10, Zawiyah "is like a ghost town." Today in Zawiyah, says Ahmed, food supplies are unreliable because store owners are too fearful to return to their stores. Psychologically, the damage appears to be deep, with real anxiety among rebel supporters about possible further retribution. My conversation with Ahmed was conducted almost entirely in whispers. After an hour, Ahmed whispered, "I must go. You must leave the café first, and I will follow in a while." I walked out the door and did not look back.